The first season of the HBO crime drama series will have a January Blu-ray release. 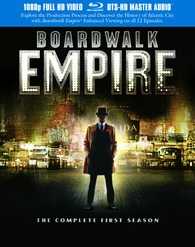 In an early announcement to retailers, HBO is preparing to release 'Boardwalk Empire: The Complete First Season' on Blu-ray on January 10. The Blu-ray will be a five-disc set with 1080p video, a DTS-HD Master Audio 5.1 soundtrack, and supplements will include: Enhanced Viewing option on all episodes, six audio commentaries, Evolving Character Dossier, Making Boardwalk Empire, and Speakeasy Tour. Suggested list price for the Blu-ray is set at $79.98. You can find the latest specs for 'Boardwalk Empire: The Complete First Season' linked from our Blu-ray Release Schedule, where it's indexed under January 10.